Donuts were never really my thing. 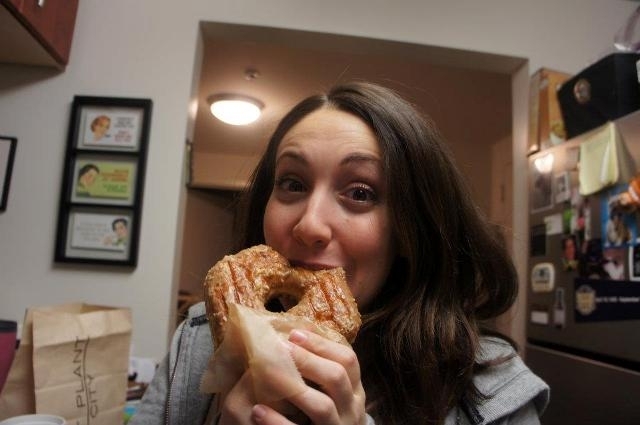 That is, until I was pregnant a few years ago and my husband brought me to New York City’s famous Doughnut Plant where I sampled several amazing flavors, including their peanut butter & jelly variety. I was in love, and it wasn’t just the pregnancy hormones. Check out my elated face. 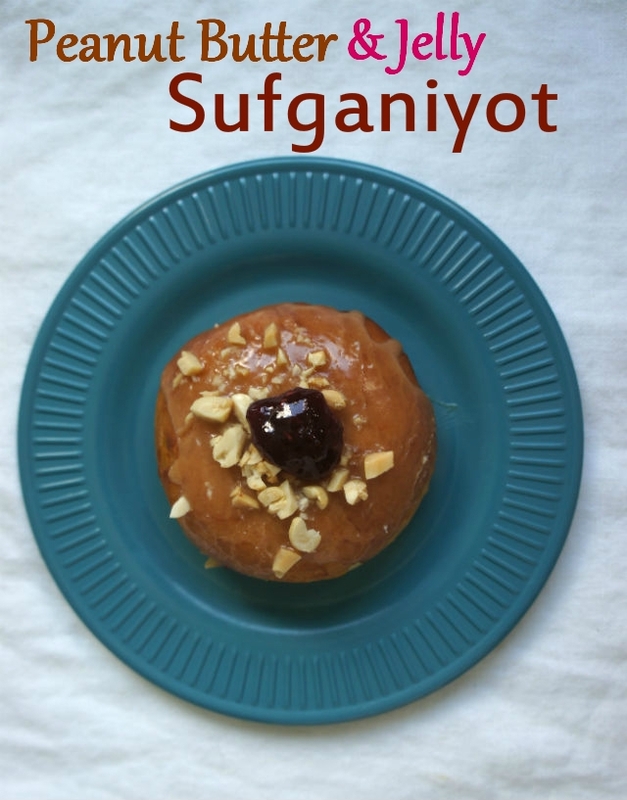 So this year when I was thinking about something fun and sweet to make for Hanukkah, I knew I wanted to try my hand at making an Israeli-style sufganiya, but with a classic American flavor pairing. After all, who doesn’t love peanut butter and jelly?! And most importantly, I love it, and I loved making these donuts. They were so delicious I might have eaten two. (I did). If you have a peanut allergy in your family, you can swap out the peanut butter for almond butter, cashew butter or even sunflower butter. Instead of adding chopped peanuts to the top, add chopped salted almonds or cashews. Combine yeast, 1 tsp sugar and water in a small bowl. Mix gently and allow to sit until top gets foamy, around 5-10 minutes. In a stand mixer fitted with dough hook, add flour, sugar, eggs, butter, nutmeg and salt. Add yeast mixture and mix on low for 2 minutes. Increase speed and mix another 5 minutes. You can also do this by hand with a wooden spoon, which will take slightly longer. Place dough in a greased bowl. Cover with a damp towel and allow to rise 2 1/2 -3 hours. Roll out dough on a lightly floured surface. Using a round biscuit cutter or drinking glass, cut rounds. Place on a large plate, cover with plastic wrap and allow to rise another 20 minutes. 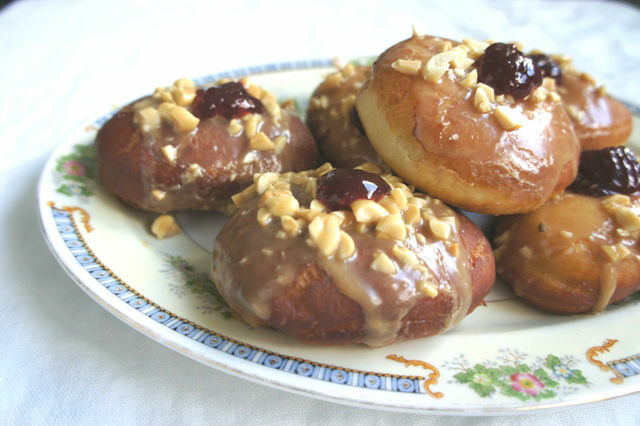 While doughnuts are rising again, whisk the milk, peanut butter, powdered sugar and chopped peanuts together to make the glaze. In a large skillet, heat vegetable oil over medium heat until a thermometer reads around 370 degrees. Fry each round for around 30-40 seconds on each side. Using a slotted spoon, transfer to a paper-towel-lined baking sheet. Immediately spoon peanut butter glaze over the top. Fill a pastry bag with jam and cut tip. Using a wooden skewer or toothpick, make a hole in the side of each doughnut. Wiggle the toothpick around a bit to open up the inside of the doughnut. Fit the pastry bag into the hole, pipe about 2 teaspoons jam into doughnut. Repeat with remaining doughnuts. Add an extra dot of jam on top if desired.